Life sciences firm LabCorp on Monday announced integration with Apple's Health Records, allowing patients to store and view test results and other medical data from a variety of providers directly on their iPhone. Apple's Health Records launched in March. Announced in a press release, LabCorp's Health Records integration is restricted to users with LabCorp Patient accounts. The free service provides access to test results, appointments, billing information and more via an online portal or through an iOS app. By integrating support for Health Records, LabCorp allows patients to view lab results alongside information from other medical care providers in the Apple Health app. Users who opt in will have quick access to allergies, existing medical conditions, immunizations, medications, procedures and vitals. "Our strategy to support the increasingly engaged healthcare consumer is a critical part of our mission to improve health and improve lives," said David P. King, chairman and CEO of LabCorp. "LabCorp on Health Records will help provide healthcare consumers with a more holistic view of their health. Laboratory test results are central to medical decision making, and broadening access to this information will help patients take charge of their health and wellness, and lead to more informed dialogues between patients and their healthcare providers." 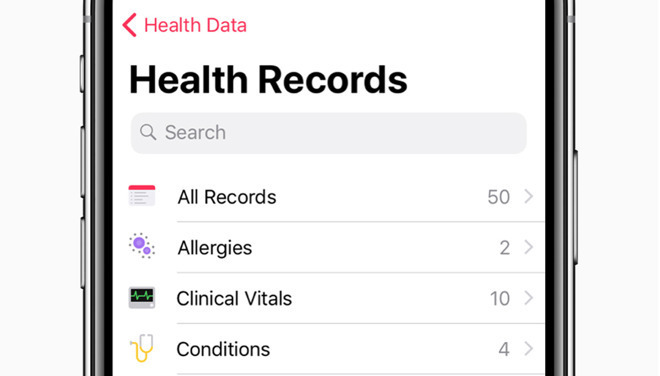 Health Records made its debut with iOS 11.3 in March. Initially, 39 health groups signed up to be part of Apple's patient data portability project, with another 36 backing the technology in August. Part of the Health app, Health Records aggregates and stores encrypted patient data, allowing users to review medical records with doctors and caregivers directly from their iPhone or iPad. Most recently, medication management app Medisafe finalized integration with Health Records to deliver drug-to-drug interaction notifications, pill reminders and more to nearly five million users.